ReRail Live was proud to showcase all aspects of the industry that are of vital importance to the safe and efficient running of the UK network. These often unsung heroes demonstrated their unique capabilities at Rail Live and were on hand to discuss the role they have on the railway and how it ultimately benefits your business. 8.6 million people use the rail network every day and BTP's mission is to help get people home safe, secure and on time.They police Britain’s railways, providing a service to rail operators, their staff and passengers across the country. We expect these demonstrations to include the presence of explosive detection dogs, anti-terrorism demonstrations and incident response units. Network Rail’s small but vital Air Operations team will be displaying its survey helicopter at Rail Live. Using high-tech thermal and visual imaging equipment, the helicopter and its team survey the railway, identifying the smallest of faults and covering vast areas quickly. It reduces the need for boots-on-ballast inspection of railway equipment and provides safe and efficient monitoring of asset condition, landslips, vegetation and almost anything else you can think of! They will also showcasing their complete range of services, including drone operations. RAIB will demonstrate its drone technology, used to survey accident sites on the rail network. It will also have on display one of its incident response vehicles, fitted out with everything inspectors require to respond to emergency situations on the rail network. Rail Live visitors will have the opportunity to see the UK’s first hydrogen fuel cell locomotive, built by the University of Birmingham’s Centre for Railway Research and Education (BCRRE) who won the IMechE’s first Railway Challenge in July 2012 to design and manufacture a 101/4in gauge locomotive compliant with detailed specifications. BCRRE is working more widely with the industry in the UK and overseas to accelerate the introduction of the technology, and has completed several collaborative research projects advancing the understanding of how the railway can use hydrogen fuel cells. 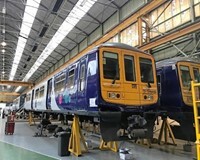 A total of 70 nine-car Class 345 Aventra electric multiple units are being built by Bombardier Transportation in Derby for the soon-to-be Elizabeth Line (currently Crossrail). The first train entered service in June 2017 between London Liverpool Street and Shenfield, which is the only route on which the trains have been used so far. Porterbrook’s first brand new Class 769 Flex bi-mode conversion – an innovative capacity-boosting electric multiple unit converted to include a diesel engine. The first Flex is due to enter traffic with Northern soon. The Flex are being converted from redundant Class 319 EMUs at Brush Traction (Loughborough). 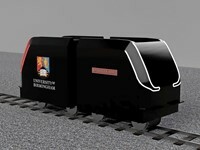 The UK’s first fuel cell locomotive, built by the University of Birmingham’s Centre for Research and Education (BCRRE). The Hydrogen Hero was built for the first Institution of Mechanical Engineers Railway Challenge in 2012. Since then, it has been upgraded to include as much new technology as possible and is now a hybrid with a supercapacitor energy storage, a silicon carbide inverter drive, and permanent magnet AC motors. Plain Line Pattern Recognition 1 is one of five trains Network Rail has that captures high-definition imagers combined with track geometry information which, when analysed with complex computer algorithms, enables candidate defects with the track to be highlighted. It replaces a method of basic visual inspection on plain line track and represents a major step forward in the detection of track faults such as missing rail fastenings and damage to sleepers. Vivarail’s battery-powered D-Train - the first of which is in its final-build stage, and is set to be ready for passenger service by the summer. Vivarail was awarded a grant by Innovation UK in July 2017 for development of battery technology in its trains. These trains are built using the aluminium bodyshell and bogies of the now-retired London Underground Bombardier D-Stock trains.